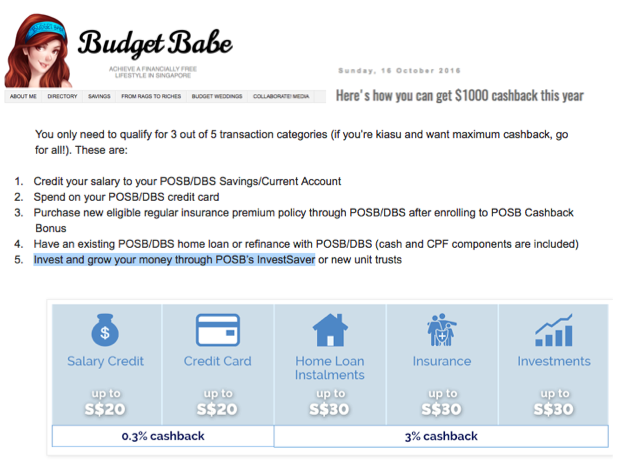 I've been receiving quite a number of enquiries regarding my previous post, where I highlighted DBS' latest Be Your Own Boss promotion as an extremely good deal. Naturally, there were people who were skeptical. I know, I know, mindsets are hard to change. It has been a few years since OCBC 360 became the first bank to introduce such high-yield savings, and people have been very skeptical of all the other accounts that followed after. Stubbornly still believing that OCBC 360 is the best, even though they've changed their T&Cs to reduce the interest time and time again. 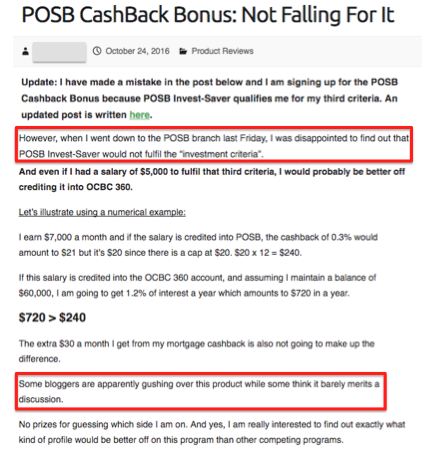 I've covered UOB One, POSB Cashback and BOC SmartSaver which all came after OCBC 360, and each post had their skeptics as well. The latest to join the stable is DBS BYOB, and if you qualify, it is without a doubt the highest-yield savings account at the moment, but naturally some folks just find it hard to believe that good deals do exist. Well, you can continue living in your bubble, because I'm here to outrightly say that OCBC 360 is no longer superior. For the higher income-earners who can afford to park aside $3000 of savings every month but still don’t spend enough to consistently hit $500 on your credit card, you can also take advantage of this promotion to get even higher interest than your existing <2% p.a. on the other banks’ schemes. I get worried when I recommend wrong stuff to you readers. BUT I was very sure I was correct and this reader was wrong. After all, it is easy to assume when you don't bother doing the hard work or the leg work to back up your claims. Singapore should have no problem saving this sum after working for a few years, as I've shown here. which I highlighted as another good reason upfront why you should switch to DBS BYOB! You can stick with your OCBC 360 and wave goodbye to almost $700 in extra interest that the rest of us will be happily getting on DBS BYOB. That includes the extra $88 sign-up bonus too you'll get if you sign up here! 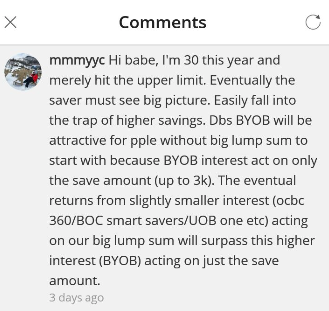 Or, if you're not young enough to qualify for DBS BYOB (<30 years old), how about UOB One, which I already highlighted last year as another superior account for those who have no problem meeting the $500 monthly credit card spend. Some of the savvier folks have already switched to UOB One in all that time you spent thinking - this Budget Babe siao ah?! OCBC 360 is obviously better please. You can read why you should totally have done so as well here. From the emails and comments you guys have left me, it seems like many of you want to sign up but are afraid there's more hidden T&Cs that will eat up your interest which you are unaware of, so I'm here to debunk some misconceptions. I remain by my original stand that DBS Be Your Own Boss is a superior product. Misconception 1: There must be some sort of cap on the max. amount! The cap is on your monthly savings amount in SAYE, with a max. of $3000 additional injections every month. 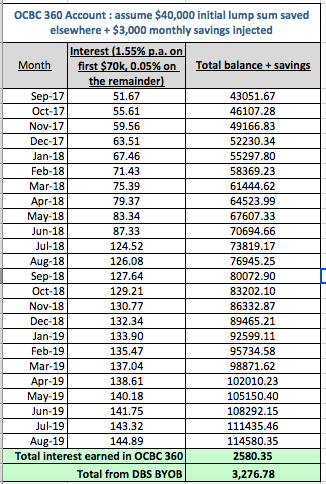 For any ad-hoc deposits outside of the automated monthly transfers, those will only earn the base interest rate (0.05 to 0.25% p.a.). Thus, if you simply followed my hack (including where I illustrated to transfer a max. of $3000 to SAYE monthly), you would still be getting the full maximum interest. I had originally recommended chalking up the 5 monthly transactions via Grab / Uber payments, grocery shopping or buying NTUC vouchers, watching a movie, eating or drinking out, or shopping at retail stores like Watsons and Guardian where you can stock up on your personal care and grooming necessities. I've checked with DBS on the legitimacy of this brilliant idea, and yes, it will qualify! So go ahead and sign up! Apparently two of my readers highlighted that when they checked with DBS, the bank customer service officer / retail branch salesperson insisted that there is a minimum of $400 spending for the 5 transactions. 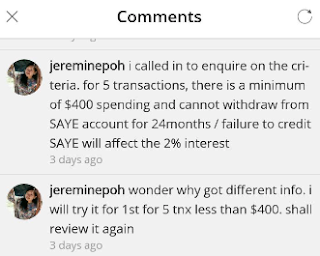 This was directly the opposite of my hack which I shared in my last post, where I highlighted how the DBS BYOB is fantastic because there's no minimum monthly spend and you could technically make as little as 5 x $1 transactions to qualify. I've since confirmed with the corporate folks at DBS running this BYOB promotion that there is no minimum spend for the 5 card transactions. I'm not sure why there are such instances of inaccuracies, but this is definitely not the first time I've heard of it. 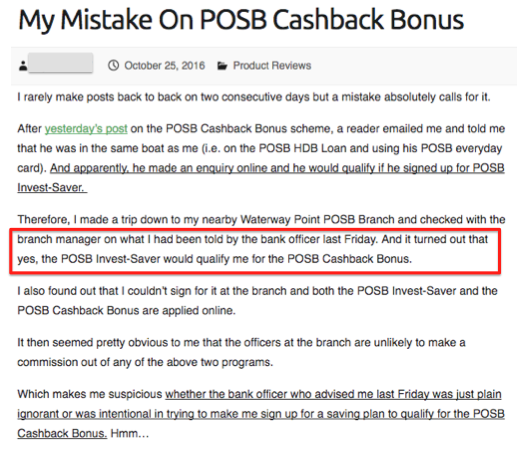 This reminds me of another incident where I strongly recommended POSB Cashback programme when it was launched, and my article also drew its fair number of skeptics. In my review, I detailed how to "hack" the scheme to get maximum benefit out of it. However, the bank officers sang a different tune to those who had read my post and wanted to sign up. I'm not sure why the bank officer gave inaccurate information, but anyway, it does pay to double check before you strike off a good deal especially when it comes to your money. Because this inaccuracy has happened more than once, I just wanted to put it out here once and for all that I check my facts very carefully before I post, especially when it is a collaboration post with the brand. Thus, you can be rest assured that my information / recommended "lifehack" is most likely to be accurate, because I've already done the digging on your behalf prior to posting the review. Of course, if I've truly gotten my facts wrong, I'm always more than happy to make the amendments. Please, highlight them to me if you spot any! After all, we're all responsible in keeping each other accountable. I understand that it is hard to trust many social media influencers these days, what with so many exposés - such as how the UOB Krisflyer campaign (influencers) reeked of dishonesty, the Beautiful Teeth Whitening kit (here and here), and of course the Gushcloud exposé by Xiaxue. Not all of us rely on sponsored posts for a living. Some of us are actually more discerning and value the trust you've placed in us, and we're not going to break that just because of a short-term sponsorship! That's just not my style, and I'm sure I speak for many of the financial bloggers here who operate the same way. So all in all, please continue to question and do your own due diligence, but you can trust my reviews (haha!). Do also continue sharing such good deals with me, because I wouldn't have found out about DBS BYOB if it weren't for you awesome readers who had raised it to my attention. To greater lobangs and wealth! I agree with you that DBS BYOB and SAYE Promotion is a better deal than OCBC 360. It's just that the terms and conditions are more difficult to understand and there's a lower bank balance cap on which to apply the higher interest. I actually think it's easier to meet the requirements once you work them out. Same thoughts! That's why I tried distilling it, cos it seemed like so many people were quick to brush this off as another too-good-to-be-true deal! It's actually easier to meet the requirements for this than for OCBC 360.
can consider pairing the 2 if you can easily spend $500 on credit card. BYOB for salary crediting to get the 4%, 360 for credit card spending and bills payment.